I'm a big fan of 'nice spaces'. I've told Mr Reread that our new house needs to have all of these things; a driveway that doesn't back onto a busy road, not too close to neighbours, a decent kitchen and it needs to have cute spaces I can make look like something from a Frankie magazine. 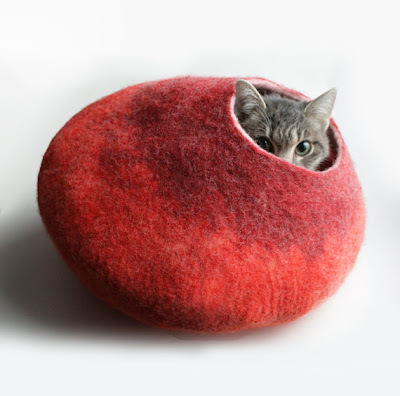 I saw this little felt cat-pod on Etsy and it reminded me of how nice it is to curl-up in a nice, warm space with a book and beautiful lighting.